Note: This book is the last in a trilogy, following Unearthly and Hallowed. The following summary may contain spoilers. Goodreads Summary: The past few years have held more surprises than part-angel Clara Gardner could ever have anticipated. Yet from the dizzying highs of first love, to the agonizing low of losing someone close to her, the one thing she can no longer deny is that she was never meant to live a normal life. I was excited to read this book, but it was also bittersweet. Unearthly is one of my favorite angel series, one of the few series in which the overarching battle between good and evil isn't black and white and the love triangle makes the story more intense rather than seeming trite. Boundless brought everything to a good end, though the road of getting there certainly wasn't easy. I mentioned before that Unearthly is one of my favorite series, and so much of that has to do with the characters. 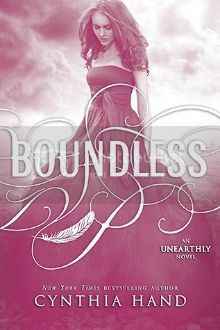 Whereas Tucker and Christian shine in the other novels, in Boundless, Clara comes into her own, embracing her abilities as an angel-blood, surrendering to her purpose, willing to do whatever it takes to protect and care for those she loves. Clara has a difficult decision to make, choosing between Tucker and Christian. For once it wasn't just a choice between guys, but a choice between following her purpose and following her heart. There were moments in Boundless that were suspenseful, sad, and sometimes even heartbreaking, but there were also moments that made me smile and fall in love with the characters all over again. There is so much I could say about this book, but I don't want to give anything away for this book or the previous two. Although I sometimes wanted to see more of some of the different events that happened, both to keep the series alive longer and to know more about the world itself, I loved the way everything came together. And even though this was the last book, Cynthia Hand was not out of surprises. She still had a few twists to throw at us, which heightened the stakes but also helped everything in the book come to a more satisfying conclusion. If you haven't read Cynthia Hand's trilogy and enjoy books with angels, vivid settings, and great love interests, you should definitely pick these books up. And if you've started the trilogy, this is one that is definitely worth finishing. I'll miss this world, but I'm looking forward to seeing what Cynthia Hand writes next! I just listened to this whole series on audio and I really loved it. I thought Boundless was a great conclusion to the series and I loved the bittersweetness of the ending. I did too. It was much better than trying to get everything to be happy, even if it did break my heart a little.